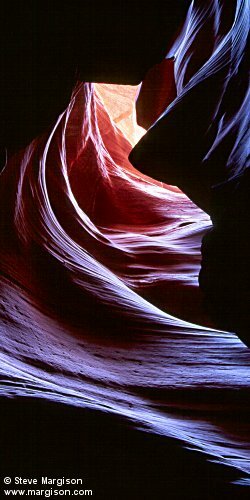 "Sharing life's adventures through photography"
Antelope Canyon - May 19, 2000. Camera: Nikon F100 & 24-50mm zoom lens. Film: Kodak Ektachrome Elite 100 slide film. 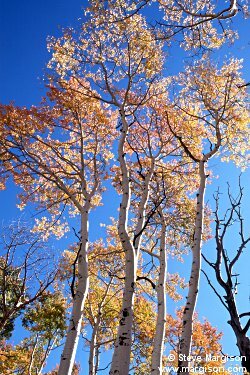 Dixie National Forest - Oct. 1, 2003. Camera: Nikon F100 & 28-70mm zoom lens. Film: Kodak Ektachrome E100 GX slide film. Multnomah Falls - July 19, 2008. Camera: Nikon D200 & 18-200mm zoon lens. Iwo Jima Memorial - April 8, 2009. Camera: Nikon D200 & 12-24mm zoom lens. Mackinac Bridge - July 25, 2010. Camera: Nikon D700 & 70-200mm zoom lens. Morning walk - August 2, 2014. Camera: Nikon D300s & 28-70mm zoom lens. On this page you will see the type of camera equipment I currently use in pursuit of my photographic endeavors. The camera is nothing more than a tool used to record images onto film or a digital sensor. It's how that tool is used by the photographer that makes the differnce as to whether the photograph is a work of art wothy of hanging on a wall or just another snapshot. It's the eye looking through the viewfinder that sees and takes a good picture. A good or expensive camera just makes it easier to accomplish that end result. Many, many years ago in a Sunday newspaper magazine section, winning pictures of a photo contest were published. While most of the pictures shown were taken with expensive brand name cameras, it was a Kodak Instamatic camera that was used to take the grand prize photo. It's the content and composition of elements in the picture that makes it a good photograph, not what kind of camera that was used. When people look at photos, whether they're hanging on a wall, published in a magazine or stored in a photo album, it's the initial impact that draws and holds their attention. For many years I used Pentax cameras (mostly LX camera bodies) and Pentax lenses. Their lenses were razor sharp and all the photos shown on this web site taken prior to May 2000, were taken with Pentax equipment. In the early spring of 2000 I decided it was time to start upgrading my equipment to auto focus to make taking pictures a little easier for my aging eyes. I switched over to Nikon cameras and lenses. Now I've taken my photography a step further. I have switched to capturing my images digitally instead of using film. I resisted changing over for quite a while, but after discovering how much easier it is to obtain my final results, I now wonder what took me so long. I hate to admit it, but I think shooting digital has made me a better photographer. I use filters very sparingly. I've always used UV (ultraviolet) filters on my lenses for protection from nature's elements, but switched several years ago to using 81A warming filters to give a slightly warmer color to my transparencies. Since going digital, I have switched back to using high quality UV filters. I now control color balance and color nuances in post processing programs like Photoshop, Photoshop Elements or Paint Shop Pro. Another filter I use, though less frequently than I used to, is a polarizing filter. When shooting film, I would use the polarizer a lot to darken the sky, but now with digital, I mainly use it to reduce the shininess on leaves and reflections when shooting water scenes. Don't get me wrong, it's still a very important filter to always have available in your camera bag, it's just that I'm more selective now when I use it. A couple of miscellaneous pieces of camera gear that I have found to be very useful, is the hot-shoe level and a Hoodman Loupe. The hot-shoe level is used so I can keep the horizon straight and level when shooting landscapes and seascapes. Many of today's cameras have a built-in level you can view in the camera's monitor, but I still prefer the old fashioned hot-shoe level. The Hoodman Loupe magnifies the image shown on the camera's monitor and keeps out stray light, especially in bright sunlight, letting me verify the composition, focus and depth of field. Following is a list of equipment I currently use to take my landscape, nature, wildlife, travel and other types of photographs. Nikon D700 camera body (Full frame sensor). AF-S DX VRII Zoom-Nikkor 18-200mm f/3.5-5.6G IF-ED. AF-S DX Zoom-Nikkor 12-24mm f/4G IF-ED. AF-S Zoom-Nikkor 17-35mm F/2.8D IF-ED. AF-S Zoom-Nikkor 28-70mm F/2.8D IF-ED. AF-S VR Zoom-Nikkor 70-200mm F/2.8G IF-ED. AF-S Zoom-Nikkor 24-120mm F/4G ED VR. AF-S VR Zoom-Nikkor 70-300mm F/4-5.6G IF-ED. AF-S VR Micro-Nikkor 105mm F/2.8G IF-ED. Nikkor L37C (ultraviolet) or B+W UV. Nikkor or B+W Circular Polarizers. Nikon SB800 Speedlight w/ remote flash cord. Nikon MC30 electronic cable release. Hot-shoe level (when using tripod). Hoodman HoodLoupe LCD screen magnifier. Induro AT313 legs with Kirk BH-1 ball head. Induro C214 legs with Kirk BH-3 ball head. Lowepro Nature Trekker AW backpack. Lowepro Mini Trekker AW backpack. Last updated or revised on January 22, 2016. Contents of this page copyright © Steve Margison 2002 – 2019. All rights reserved.